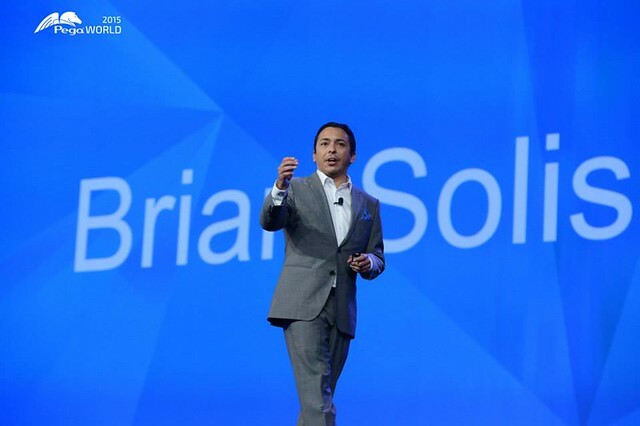 Brian Solis is consistently ranked as one of the top keynote speakers at events around the world. Brian actively keynotes conferences, summits, and corporate events. He is also available to speak to smaller teams and executives. If you’d like him to work with him, please email or call Michele Carter of ODE Management at 703-819-2511. Brian Solis is a dynamic and engaging speaker with an extensive portfolio of topics that cover business leadership and transformation, disruptive technology, new, social and mobile media, connected consumerism, and the evolution of the digital lifestyle in culture and society. Brian is not a believer in generic, “one size fits all” presentations. He tailors these important topics at various levels necessary to connect with each audience. As one of the world’s leading analysts, he also studies how the evolution of technology, business, and culture impact specific industries based on the needs of each event. His ability to connect the dots for hosts and attendees provides tangible value and direction. And, his motivational approach leaves audiences feeling empowered. Plus, he’s followed by over 500,000 people on Linkedin, Twitter and Facebook! 1. Educational – Help participants understand what’s different about now, the opportunity before them, what they need to do moving forward, and how to be successful in new endeavors. 2. Inspirational/Motivational – Turns audiences into stakeholders by motivating participants to embrace new opportunities and pursue new possibilities. 3. Communal – Bring leadership teams and organizations together around a new or renewed vision, mission, and purpose. Digital Darwinism: How incumbent companies are making mistakes that are sealing their fates and how to do to survive and thrive in an era of digital Darwinism. Digital Transformation: The State and future of digital transformation and how it’s changing businesses at the very core. Leadership Comes from The Top and Anywhere: Change agents and business mavericks and how they inspire change and what it takes to identify, empower and lead them. From CX to DCX to X: How the digital customer experience is inspiring change for the entire customer experience. Introducing Generation-C: Meet Generation C, your connected customer and why Millennials and kids aren’t the only customers changing the world. Experience Design as the New Brand: An experience divide exists between your brand promise and what people experience and share. Learn how to create experiences that engender fans and builds wildly successful relationships throughout the customer lifecycle. The Four Moments of Truth: How micro-moments are reshaping the new customer journey in each of the four moments of truth. Mobile is Eating the World: In a world where customers in every industry want you to look and feel like their favorite apps, learn how to design customer experiences in a mobile first and mobile only world. The Future of Retail/Shopping: Brian re-imagines the world of shopping, payments and retail/e-tail. Silicon Valley and Future Technology: What is it about Silicon Valley that drives innovation and disruption, what’s the hot new tech and what’s the next big thing?! The Rise of Corporate Innovation Centers: in Silicon Valley and around the world, businesses are opening up innovation centers. What can these efforts teach you about the future of business? Find out. Culture Shift: Technology is impacting business and society. See the world through the eyes of your customers and employees to feel a little empathy to drive human-centered innovation and compete for relevance. Act Like a Startup: Disruption can come from anywhere and it takes a new approach to compete against threats large and small. Here’s how to think and act like startups to innovate differently. We ARE the Change We Wish to See in the World: Times are changing, expertise is aging, everyone of us needs motivation to see and do things differently. Brian was inspired by Leo Tolstoy, “Everyone thinks of changing the world, but no one thinks of changing himself.” He helps audiences shift perspective and feel inspired to see the world in a new light as a way of driving change in leadership, work, and personal aspirations. The Engagement Gap: Employee engagement and morale are at record lows. Get introduced to the engagement gap and take steps to boost happiness and productivity by engaging Millennials and all employees with a new philosophy and infrastructure for work. Leadership vs. Management: Shifting from a rut of management to that of leadership. See examples of how executives learn how to lead in roles from the top to bottom to inspire a more passionate, loyal and profitable workforce. Culture of Innovation: Learn about the 12 pillars of innovation and how companies are investing in new cultures to nurture innovation internally. Humans Need Not Apply: Digital literacy is everything now. Executives don’t live life as their customers do. Workforces and intellectual capital are aging. New expertise is in demand. Learn how to identify and train/hire for the jobs of the future. R.R.S. : The future of marketing is tied to a thoughtful approach of R.R.S. (Relevance. Resonance. Significance.). Develop marketing strategies and campaigns that matter in a real-time, always-on, mobile-first world. Responsive Storytelling and Engagement: Social, mobile, real-time changed the game for marketing, advertising and content strategies. Learn how to think of marketing as “social objects” that talk to and through people, shifting from a world of impressions to expressions. The A.R.T. of Engagement: Marketing breaks down to actions, reactions and transaction. Design engaging marketing programs that handhold people through the funnel and the new customer journey. Digital Influence and The New Influencer: From Twitter to Instagram to Youtube and everything in between, meet the new influencers and how to engage them.